A perfectly creamy, nutty, salty and subtle sweet butter to replace any nut butters in your kitchen. Spread it over celery sticks, carrots, bananas, apple slices or just eat it plain. It’s very nutritious. Blend everything togerther in a high speed blender (like Vitamix). Blend until fully processed to a buttery consistency. Stop few times if needed to scrape down the sides of the container and maybe add 1 more tablespoon of water to reach desired consistency. Store in the refrigerator in an airtight glass jar. A rich and delightful ricotta to eat by itself or as a dessert topping. Top some wild blueberries with this Lemon Almond Ricotta and sprinkle with one of the best sprinkles Mother Nature provides: raw and fresh wildflower bee pollen and you get a sophisticated flavor with the best of nutrients. Add enough water to make a cream and blend everything together in a high speed blender (like Vitamix) until the mixture is silky and smooth. Use this very easy recipe to replace your store bought mustard made with white or wine vinegar and possibly other questionable ingredients. Mustard seeds are very popular for their taste, but did you know they deliver a long list of health benefits due to their high content of glucosinolates? * Mustard seeds also contain magnesium, selenium and omega-3 fatty acids. And these tiny seeds are a fantastic decongestant and expectorant so mustard seed can help with respiratory disorders. Add this mustard to meat or fish, or use to make a delicious salad dressing. Soak the mustard seeds in apple cider vinegar until fully plump (12 hours). Blend everything in a high speed blender (like Vitamix). Add water as necessary to obtain a creamy consistency. Keep in a covered glass jar in the refrigerator. * glucosinolates are natural components of many pungent plants such as mustard, cabbage, and horseradish. Glucosinolates may stimulate apoptosis (death) of human tumor cells. This is a light, gorgeous and a perfect creamy mayonnaise that is dairy free, gluten free, egg free and nut free. It’s very fast and simple to make as it has only 5 ingredients and needs just a mason jar and an immersion blender. Combine the coconut cream, lemon juice and garlic in a mason jar. Blend on high for 30 seconds with an immersion blender. Add 1/4 cup of sunflower oil and blend one more minute until the ingredients have emulsified (the oil is incorporated with the other ingredients). Add the remaining 1/4 cup of sunflower oil and blend until the mixture reaches the consistency that you prefer. Add sea salt to taste. Refrigeration will allow the mayonnaise to set up a bit. Place all ingredients in a blender (like Vitamix) and process until smooth. 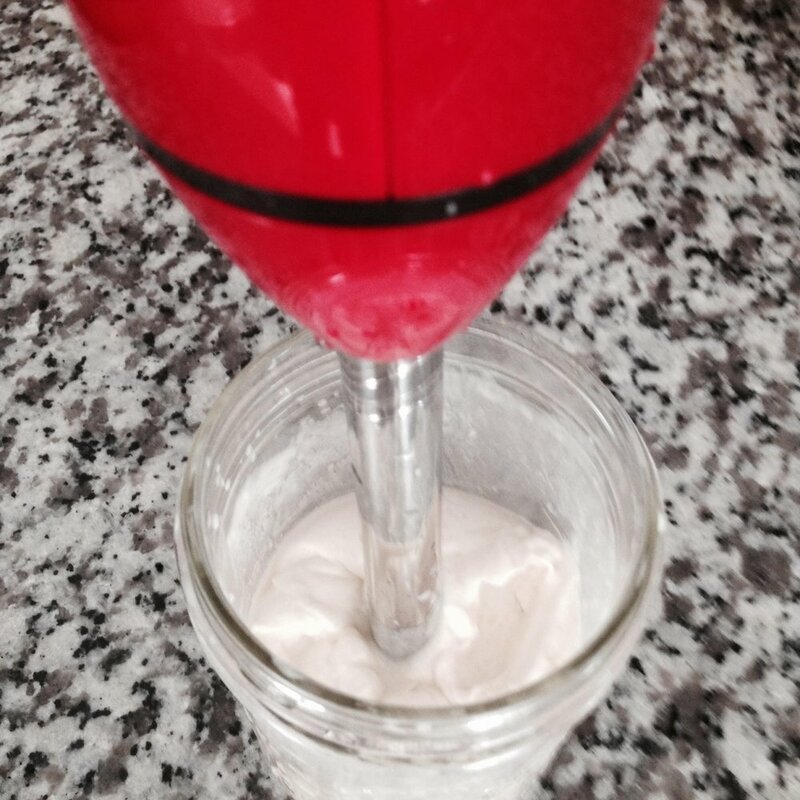 Blend the first 2 ingredients on low speed in a high speed blender (like Vitamix). Add the rest of the ingredients starting blending on low and increase the speed as you go. The whole process should take you no more than one minute. Don't over blend it.